Although aggregate demand in the Australian economy is currently a little subdued the Reserve Bank of Australia seem to have plenty of ammunition available for stimulatory purposes. With the cash rate being 4.75% (see graph below) it could be said that the RBA are ahead of the play with regard to rate increases. The labour market appears to be strong and the terrible events in Japan will no doubt lead to a surge of commodity demand as rebulding and reconstruction proceeds. With this in mind there is the chance of capacity constraints and therefore investment in the mining and related industries will be essential. In the year the RBA will need to be aware of demand pressures as the economy puts its foot on the gas once again. With this expected growth and boost to employment figures the RBA will weary of the Australian NAIRU (see previous post – Australia’s NAIRU) and will want this unemployment figure to drop at a very slowly rate as inflationary issues could become prevalent. 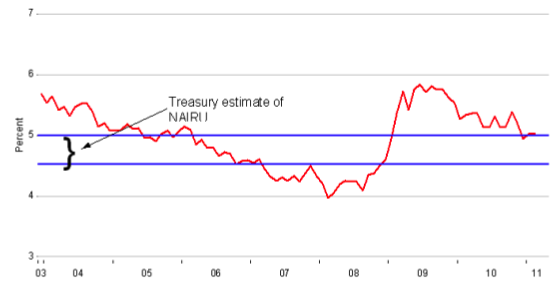 The Treasury estimate for the NAIRU (also know as the Full Employment range) is between 4.5% and 5% – see graph below. So, while Wall Street became fixated by sub-prime mortgages and collateralised debt obligations, Australia concentrated on its natural endowments. 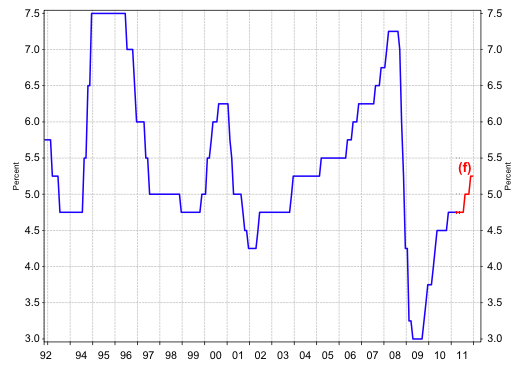 Remember Australia never went through an official recession during the finanacial crisis.